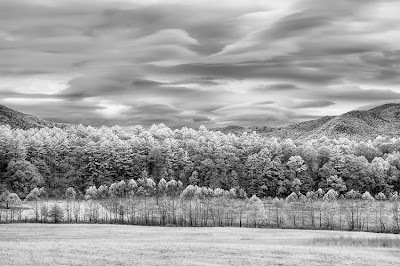 Infrared photography can expand your photographic horizons. It offers the photographer an alternative way to "tell the story" creating an image that is more surreal and enchanting than possible in color. Various subjects reflect and absorb light infrared differently than in color, and the results may surprise you! Trees such as maples are highly reflective of infrared light, conifers less so. Clouds become wonderfully expressive as with this image that I photographed in Cades Cove, in the Great Smoky Mountains. The various textures work beautifully together to create a compelling image. With digital infrared photography, the journey is unlimited! You can create timeless black and white infrared photographs that have a classic film look. Or, you can photograph contemporary scenes that include a vivid blue sky with a little help in Photoshop. You can also photograph using light sources other than the sun, creating dramatic images even at night. A digital camera is very sophisticated, having the ability to capture light not only in the visible spectrum, but in the ultraviolet and near infrared spectrum as well. Camera manufacturers place a "hot mirror" inside the camera to block ultraviolet and infrared light and allow visible light to pass through to the camera sensor. However, the digital camera can be modified to capture infrared light, allowing the photographer an exciting alternative to color photography! In the Cades Cove image, I didn't use any fancy Photoshop filters or creative techniques, simply infrared photography. You can achieve results like this by converting a camera to infrared, exposure times are normal, the camera can be hand-held. Life Pixel converts digital cameras to infrared, use code DEB for a discount. I'm endlessly inspired by students in my online course Digital Infrared Photography at BetterPhoto.com. This is my second time teaching this course, students join in for online learning and fun from various parts of the world which makes it so interesting. I take a creative perspective in both my book and course, and we cover all kinds of artistic ventures! Consider rounding out your photography - shoot infrared!